This security control relay Wieland Electric consumes less energy than a standard equivalent component. 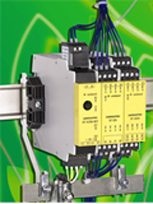 Samos PRO control relay has a CPU and can manage 96 safety inputs and 48 safety outputs. Ignored for a long time, the electricity consumption of equipments and panel automation has begun to interest manufacturers and some contractors. Until now, the few Watts lost in thermal heating by a circuit breaker or an automat had been going almost unnoticed in a world without energy balance. Today, manufacturers attitudes are changing and their R&D teams are working on this subject. The low-energy impact intrinsic to the equipment sometimes also becomes a sales argument. The European parliament has demanded that in 2019, the future buildings in the European Union will be “zero energy”. So every new building in E.U as of 2019 would have to be able to produce as much energy as it consumes. There are also reflections in progress for existing buildings. This means that in less than 10 years, building equipments would have to consume very little energy. The least energy loss related to panel equipment will have a very different importance. In the service sector, equipments of automation and technical management are directly concerned: automats, switches, PC, sensors etc. Those constraints, applied to building trade should accelerate manufacturers R&D, with clear impact for industrial applications, knowing that more and more products are similar from one sector to the other. ISO 14001 corresponds to a search of continuous improvement from the environmental point of view. This method specifies requirements relating to an environmental management system that permits the company to develop and implement the policies and goals, taking into account legal requirements and other requirements subscribed by the company. This method is applicable to environmental aspects identified by the company as the ones that can be controlled and influenced. So, energy savings can be a part of this schema. For the automat M340, Schneider Electric has initiated an eco-design approach: the automation platform Modicon M340 reduces its energy consumption by 25%. Same progress for the weight and the packaging with a gain of 70%! An industrial process with an instantaneous power of many Megawatts hides widely the thousands or tens of thousands of watts, consumed in the total scale in the factory by the automation equipments. By the way, the saving is real! You just have to integrate the kWh in one year to realize the potential for savings. Otherwise, 1 watt consumed at the equipment level represents much more at the level of counting the invoices. You just have to look at the output chain to see it, between the delivery item 20kV of the industrial site and the panel components, intervene power transformers, circuit breakers (as an example, a 400 A circuit breaker consumes 200kWh/year! ), inverters and power transformers. In total, almost 1.4W will be really consumed for 1W at the entry of the equipment, without forgetting the electro-technical components dimensioning directly related to the charge. Economies of scale can be considered on the circuit breaker caliber, on the power of an inverter or of a transformer. In fact, as a whole chain we have to study it to realize the possible energy potential. In the service sector or housing environment, the stake is higher because consumptions are more analyzed and energy regulations are always stricter. Added to this is the awarding of energy labels (BBC, Passivhous, Minergie …) or the application of steps such as HQE (High Environmental Quality). Though microprocessors of automation equipment are doing impressive progress in the field of energy consumption, supplies used to lower voltage from 230V to 12V or 24V often still show mediocre performance! Besides all the efforts made, classical supply keeps stagnating with an output of 80%. The rest goes into heat. For example, for a 500W supply, 100W participates in the warming of the cabinet or of the housing. We have to manage with that. As such, a choice of energy-efficient equipment and automation avoids sometimes to cool or even to ventilate a cabinet prone to overheating. This results in investment savings and particularly operating costs. Increasing the decentralization of intelligence and treatment, the components and others sources of consumption have multiplied. This trend is pernicious from the point of view of energy, because the less the component consumes, the less the buyer turns his attention on the energy efficiency of the product: “100W won’t make a big difference”. In fact it will! When a component is used in 200 copies in the factory, it represents a difference of 20 000W. For a process working 2x8h 365 days a year, it represents 164 kWh: that is more or less 13k€ of potential savings in one year. It is obvious that we don’t change a controller or a switch for energy reasons. But when we have to replace it, why don’t we consider this question? or copy this trackback: http://engineering.electrical-equipment.org/energy-efficiency-building/focus-on-electricity-consumption-of-control-panel-components.html/trackback from your own site. Yes indeed this area of energy saving/reduction has been completely ignored in the past. It’s so good to see companies investing in research in this area. This will definitely have a good inpact on overall energy saving from factories, intelligent buildings to normal home users. How to calculate the demand in KVA with given KW load for certain area or plant. A simple fluorescent tube light wastes about 20% of energy in the choke. Of course compared with an incandescent bulb it is more efficient but thinking of all the flu tubes around with chokes. how to caliculate wire sizes? Fascinating article, I learned so much about control panel components and their electrical consumption.